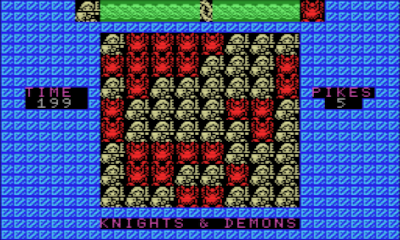 Being a retro geek and a high fantasy nerd, seeing a new game on the ZX Spectrum called Knights & Demons (from Kabuto Factory) naturally got me all aflutter. You can imagine then, my disappointment when I realised it was actually a puzzle game based on the old Light's Out toys from the 1990s. Nothing wrong with that, of course, but I did have to readjust my expectations somewhat. Light's Out was a puzzle game featuring a grid of lit tiles, where the aim was to switch off all the lights on your board. By selecting a tile on the grid you switch the status from on to off (or vice versa) as well as those tiles directly adjacent to the one you have just selected. Knights & Demons essentially takes this concept and replaces the lights with, you guessed it, knights and demons. It also introduces 'pikes', which allow you to switch off a tile without flipping any of the other tiles around it, which is useful for dealing with individual tiles when you don’t want to switch the others adjacent to it. As you progress through the game the number of pikes you possess doesn't reset, so the game becomes progressively harder as the number of pikes dwindles and you have to rely on your skill alone to clear the gameboard. When starting the game you choose from easy, medium or hard settings but it’s unclear what differentiates the difficulty settings. Presumably the boards are more difficult to clear, certainly when playing on hard you are given more pikes and time to complete the board to reflect the increased difficulty. There is a light-hearted plot, for what it's worth, which involves a bathroom-based 'domestic accident' taking down the king, leaving you to step up to the plate and command his armies against the forces of evil. Graphically the game is well presented, on the ZX Spectrum at least, harkening to the classic colourful style of the Spectrum (e.g. Rainbow Islands) rather than in monochrome (e.g. Robocop) or the earlier, basic style (e.g. Splat!). Admittedly it's only a single screen game and there's a fair whack of colour clash but it's nice to see and the loading screen is similarly well drawn. Aurally there's nothing to speak of beyond a simple but nice intro tune, however a game of this style will always stand or fall on the gameplay anyway. Given the effort that's gone into the graphics it's perhaps a little odd similar effort hasn't gone into some sound effects, but on the Spectrum in particular they can grate in puzzle games if they're not well implemented. On the MSX and CPC things are much more basic, with no proper background to speak of though oddly the MSX version does have some sound effects when you select a tile that the ZX Spectrum lacks. Ultimately the differences are cosmetic but the ZX Spectrum version feels the most polished of the three. Speaking of gameplay, the game is pretty simple to pick up and get stuck into although it's debatable how many times you'll want to play what is essentially the same gameboard over and over again, even on a different difficulty setting. Although the starting combination of knights and demons (i.e. on and off tiles) changes each time, there's only so many times you can solve what is essentially the same puzzle before becoming a tad bored. 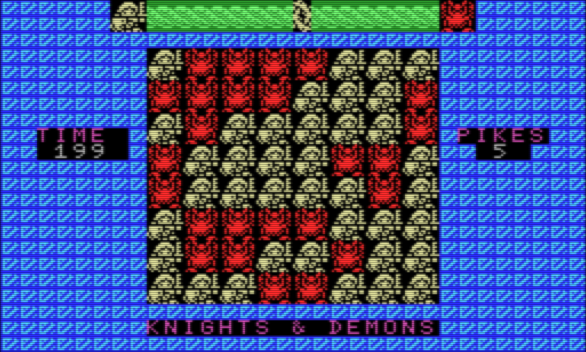 A meter bar across the top of the screen shows the balance between the armies of knights and demons. It shifts depending on whether you clear a gameboard by filling it with knights or demons allowing you to complete the game by moving it all the way to one side. It provides the game with an element of a quest objective and allows a measure of replayability by giving you the option to clear the board via knights or demons. However it's frankly pretty arbitrary and given that the plot puts you in the role of the good guy, attempting to fill the board with demons feels slightly contradictory. 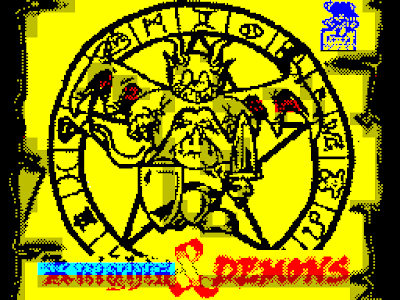 Ultimately Knights & Demons is a pretty simple puzzle game and while the graphics are bold and colourful and the puzzle is well implemented, but nonetheless the game lacks longevity. Puzzle fans may get a kick out of it and it feels mean being slightly dismissive of a game that clearly had the effort put in to make it as good as it could be, but given the competition in the retro market at the moment it's difficult to see how it stands out from the crowd to demand your time. Download the game for free or buy it on cassette for 2.40/4.50 Euros here (from the Kabuto Factory site). Run the CPC version using WinAPE (freeware).